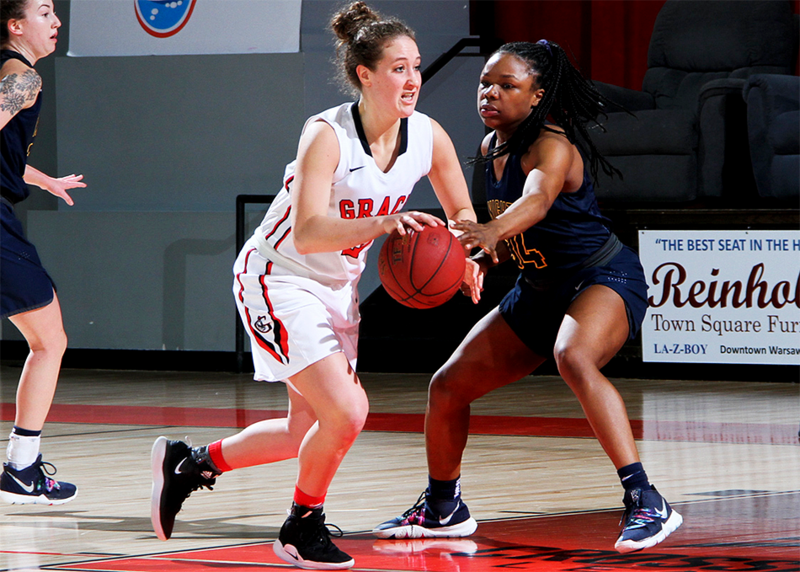 Grace’s women’s basketball team was unable to sustain a second quarter lead, falling 71-62 to No. 7 Marian on Saturday. The Lady Lancers (15-13, 9-7 CL) suffered a tremendous disadvantage in rebounding; the Knights (23-5, 14-2 CL) held a plus-21 rebounding edge at 41-20. Marian scored 18 points after an offensive rebound, compared to just two second-chance points for Grace. The game started slowly as each team missed their first three shots. Kamryn Hostetler made the first field goal of the contest three minutes into the game. Grace gained an advantage midway into the first quarter. Hostetler and Brooke Sugg buried back-to-back 3-pointers, and Hostetler then finished off a fastbreak layup for a 9-6 lead. The Lady Lancers’ defense kept the Knights off balance. Marian committed six turnovers in the opening quarter, and Grace led 14-8 after an athletic layup from Kyannah Stull. In the final minute of the quarter, Stull drilled a triple to help Grace to a 17-11 advantage by period’s end. The Knights proved their ranking with nine unanswered points to start the second quarter, regaining the lead 20-17. Grace smartly used a timeout at that juncture to regain composure, and Stull calmly sank a 3-pointer to tie the game. Marian used its height to try to dominate Grace, scoring seven points after offensive rebounds in the quarter. The Knights opened up a six-point lead until the final possession. Pam Miller swished in a jumper from the free throw line as time expired, cutting Marian’s lead to 32-28 at halftime. Marian held a 24-8 edge in rebounding, grabbing 12 offensive boards. Grace’s two leading scorers (Sugg and Vironnica Drake) were held to three combined points, but Stull’s 11 points and Hostetler’s 7 points gave Grace a boost. Grace did its best to keep pace in the second half, but the Knights had an answer for each Grace run. Drake and Sugg, who were muted in the first half, came alive after halftime. Sugg scored 12 points in the second half, and Drake added eight more. But the Knights’ offense proved to be too efficient. Marian shot over 50 percent from the floor in the second half, including a 7-of-13 performance (54 percent) from the 3-point line. Stull amassed a career night on the offensive end, scoring 19 points with three steals. She shot 4-of-7 from beyond the arc. Sugg scored 15 points to go along with two assists and three steals, and Hostetler added 11 points and a pair of steals. Drake tallied eight points and nine boards, and Miller added 2 points, 2 rebounds and 2 assists. The Lady Lancers have one week remaining in the regular season. Grace hosts Huntington on Wednesday at 7 p.m. in a game with tremendous implications on the league standings. Grace currently sits in a tie for fifth place in the league, one game behind Huntington for fourth. Grace’s Logan Godfrey slams home two against Marian. Grace’s men’s basketball team could not keep up with the firepower of No. 11 Marian, losing 83-74 on Saturday. The Knights (22-6, 11-5 CL) shot 49 percent for the game and 45 percent from beyond the arc, and Marian was even better in the first half. Logan Godfrey posted an impressive 20-point, 10-rebound double-double on Senior Night, and Charlie Warner was Grace’s leading scorer with 24 points. Warner did not miss a 3-point shot on the night, going 6-of-6 from deep. The Lancers (13-15, 3-13 CL) never led on Saturday. Marian quickly jumped out to a 16-6 lead after just six minutes of action. Grace struggled to cut into Marian’s cushion and trailed by double figures for most of the half. Warner did his best to keep pace with the Knights; he hit consecutive 3-pointers to bring Grace to within 37-30. But Marian still led 44-36 at halftime despite a last-second putback basket by Godfrey. The Knights made 17-of-29 from the floor (59 percent), and Marian drilled 8-of-12 (67 percent) from the 3-point line. Godfrey, Warner and Haden Deaton combined to score 34 of Grace’s 36 points in the first half. Marian was consistent to maintain its lead throughout the second half and eventually built the cushion up to 16 with 12 minutes remaining. The Lancers made a push at that juncture, however, with a 9-0 run. Warner buried a 3-pointer, Deaton scored in the paint, and Godfrey made back-to-back shots. After Godfrey’s last basket, the Lancers trailed 70-63 with 8:25 to go. Grace was unable to bridge any further, though, and fell by nine. The Lancers shot 41 percent compared to Marian’s 49 percent. Grace did grab 15 offensive rebounds and had 17 assists to just 10 turnovers. Deaton scored 19 points with seven boards after making 8 of 15, and Jaret Sons had 7 points, 3 boards and 2 assists. Eddie Gill IV added 2 points, 6 rebounds and 3 assists, and Tyce Frank handed out six assists with two steals. Saturday was also Senior Day to honor the graduating class of Godfrey and Tim Swanson. The loss officially ends Grace’s chances to get into the Crossroads League Tournament. The Lancers will have a shot to qualify for NCCAA Nationals with one week remaining in the regular season. 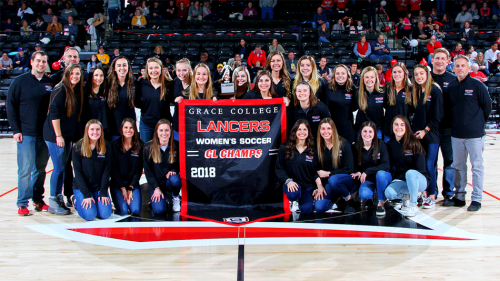 Grace’s final home game of the regular season is on Tuesday, hosting Huntington at 7 p.m.
During the basketball afternoon at the MOCC, Grace’s women’s soccer team was recognized on Saturday as the 2018 Crossroads League champions. The Lady Lancers got to show off their championship gear at halftime of the men’s basketball game. Grace also displayed their conference championship banner which will hang in the rafters of the MOCC, the first in program history. The Michael Voss-coached team won a program-record 20 wins in the fall and hosted an Opening Round match for NAIA Nationals. The team finished the season ranked No. 1 in the NAIA in shutouts and No. 13 in goals scored, cementing a memorable year. Grace ended the year ranked No. 16 in the NAIA Coaches’ Poll. Voss, Aubrey Feipel and Corinne Villalobos all spoke to the full crowd at the MOCC during the halftime ceremony. A rare boys matinee at the Tiger Den had Warsaw edge Merrillville for its seventh win in a row. Nolan Groninger notched a career-high 25 points and also led the team with four assists and three rebounds. Each team had its moments in the first half, Warsaw running out to a 21-11 lead after a quarter, only for Merrillville race to a 33-26 halftime lead after a 22-5 second quarter. Warsaw righted the ship in the second half, shooting 63 percent from the floor (12-19) and were 16-22 in the game from the free throw line, Groninger 9-12 on his own. Wyatt Amiss added 10 points and Trevor Rumple had seven points off the bench for the Tigers. Merrillville’s duo of Keon Thompson and Darryon Bundy combined for 37 points and 12 rebounds. Warsaw moves to 13-4 overall with its next test on the road next Saturday night at Class 4-A No. 2 Carmel. For the second night in a row, Wawasee pushed its opponent to overtime. But for the second night in a row, Wawasee couldn’t find enough magic to pull off a win. The visiting Cavemen outlasted the Warriors in the Hardwood Teepee a night after both clubs suffered conference losses. Mishawaka, which fell to Adams by nine, used a key three from Sam Shively and five free throws from Raheem Braiton in the overtime period. Wawasee, which fell in double overtime at Goshen Friday night, didn’t make a field goal and were 5-7 from the charity stripe. Bennett Hoffert led Wawasee with 15 points and Austin Miller rolled up 12 points, four rebounds, four steals and four assists. Grant Jablonski led the Cavemen (9-8) with 14 points and Braiton added 10 points. The Mishawaka JV picked up a 52-39 win over the Warriors. Wawasee (5-14) hosts Class 2-A No. 3 Westview Tuesday night. The Panthers’ struggles continued Saturday night at St. Joe, losing its fifth straight contest. After taking a 13-12 lead in the first quarter, St. Joe’s size started to take over in what amounted to a 15-3 run to separate the two teams. NorthWood had Trent Edwards lead its attack with 17 points while Ben Vincent finished with nine points. Matt Dutkowski and Jason Borkholder combined for 10 rebounds. Jack Futa led the Indians (8-8) with 12 points and eight rebounds and JR Konieczny had 10 points and eight rebounds. NorthWood (6-12) will host Tippecanoe Valley Tuesday. Beau Hepler had ice water in his veins, hitting a three-pointer to lift his team to a home win Saturday night. Hepler curled around the corner and took a feed from Tye Orsund to nail a three with just over seven seconds left to put the Trojans up one. Clinton couldn’t get a shot to fall in the final six seconds, boosting Triton to the win at the Trench. Hepler finished with eight points, but two Trojans reached double digits in Ashton Oviedo with 11 points and Keegan Westafer with 10 points. Clinton had a similar lead in its scorebook, with Seth Shetler leading with 11 points, Herschel Miller with 10 points and CJ Mathis with nine points. The JV contest was all Trojans in a 57-13 final. John Gardner led the charge with 17 points and Cole McKinney tossed in 12 points. Triton moves to 7-9 overall and continues a busy stretch with a game Tuesday at Rochester, part of an eight-game-in-14-days run. Warsaw withstood challenges from NorthWood and Northridge to claim the Northern Lakes Conference freshman boys basketball title. In the opening game, to which the winner’s bracket was played at Wawasee, Warsaw took on the Panthers and raced out to a 17-6. NorthWood clawed back to cut the Warsaw lead to three, but could get no closer. Judah Simfukwe paced the Tigers with 16 points and Hunter Rice added nine points. Caden Graham led the Panthers with 10 points while Cole Davis piled up nine points and six rebounds. In game two, Landon Gause notched 15 points and Holden Babb came in with nine points, but the Warriors couldn’t stop Northridge in a 50-38 final for the Raiders. In the consolation final, a balanced effort saw Wawasee hold on for a 26-21 win over NorthWood. 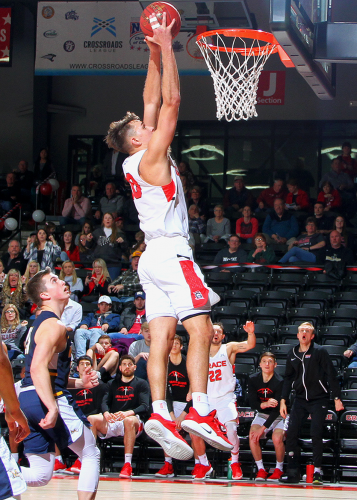 Caden Welty and Gause both had five points and Nate Larson added four points for the Warriors (12-7) while Brady Chupp led the Panthers (10-7) with seven points. In the championship, Simfukwe had a big game with 20 points to lead the Tigers to a 51-39 win. Hunter Rice chipped in 13 points for the Tigers, which finish its fine season 18-1 overall. 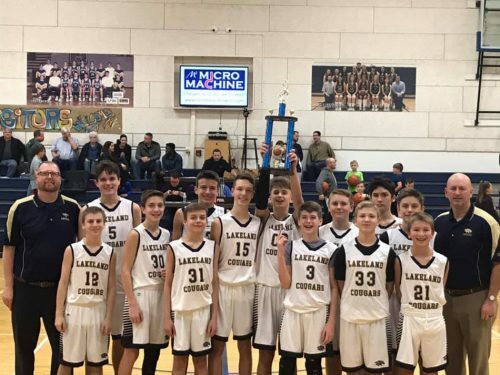 Lakeland Christian Academy won all four of its games in the boys and girls LCA Invite basketball tournaments Saturday, winning matching titles for the first time in the history of the tournament. LCA’s boys beat Clinton Christian in the opening game, then took down St. Paul’s Lutheran 39-28 in the championship. The Lady Cougars beat Granger Christian to make the final, then topped Clinton Christian 24-14 for its title. In the boys final against St. Paul’s, LCA countered 22 points from Ian Raasch with 22 points from Seth Martin. The decider was 10 points from Jamie Wyatt. In the opening win over Clinton, Martin and Wyatt combined for 28 points while Will Hotchkin and Ben Jackson each added 10 points. In the girls title run, Finley Hobbs led LCA in its opener over Granger while Alexis Miller added seven points. In the final, Maddie Silveus poured in 10 points while Hobbs, Olivia Miller and Cara McCrum all finished with four points. 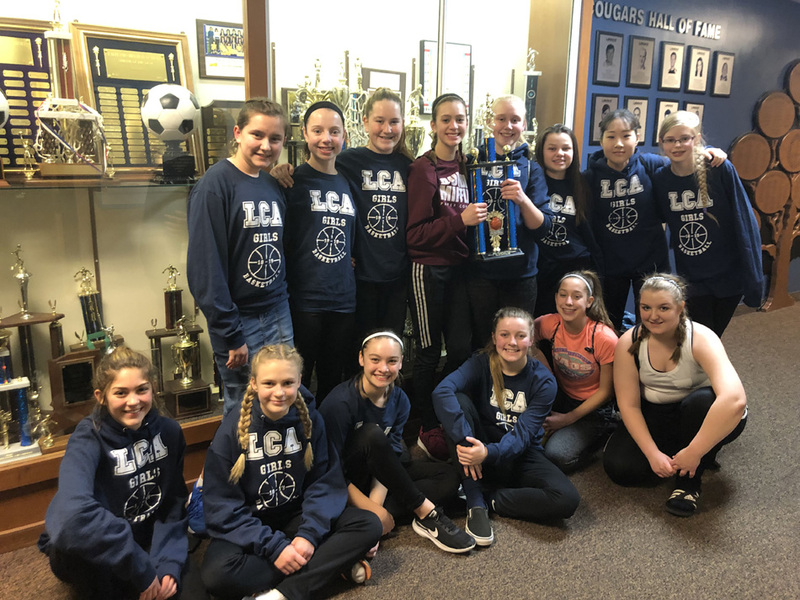 LCA’s Jr. High girls basketball team won its home invitational championship.